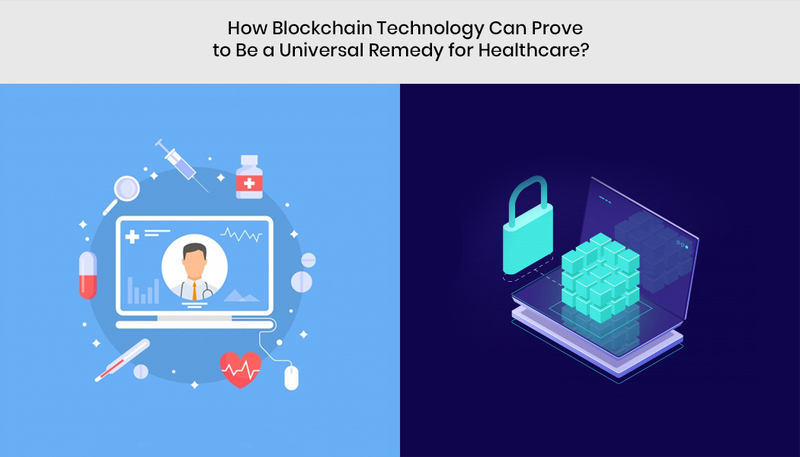 How Blockchain Technology Can Prove to Be a Universal Remedy for Healthcare? With an escalating interest in a variety of applications ranging from financial services, data management, IoT cybersecurity, data management, and health care industry, blockchain has recently gained considerable attention. However, with all this, there is one aspect which can be improved and successfully redesigned by distributed ledger that is blockchain. Blockchain may significantly prove to be beneficial to patients, doctors, and even pharmaceutical corporations. Since the modern healthcare industry struggle with a lot of problems, blockchain technology may be applied to solve some of these problems. By completely changing the healthcare system, blockchain development technology can greatly help the healthcare industry to overcome some of the challenges that it’s facing. For instance, it can help improve integrity, universal access, traceability, security, and interoperability. This implies that it holds the key to boosting the current healthcare situation. With blockchain, different healthcare can exchange data among themselves. Here are some other challenges that blockchain can solve. Since patients are not static, they can change names, switch providers, move houses, and even buy new insurance plans. Making sure that patients identify follows her throughout her life without deletion, duplication, and other mistakes is a daunting task. Misidentification of the patients has in the past lead to improper treatments and poor patients experience which could negatively affect the caregiver. Thankfully, blockchain can be used to link disparate organizations so that everyone gets his own electronic health records and data repositories. The current healthcare industry has suffered a lot from data leaks that have ended up costing the hospitals millions of dollars. With no proper solutions, the industry relies heavily on the trial and error which makes it hard to secure all the platforms. Data theft and tampering are increasingly becoming a big worry hence should be dealt with as soon as possible. By using private keys, blockchain can utilize data encryption to ensure that only the receiver can have access to the data using a key. This means blockchain technology will provide the best security. With blockchain, patients will use a special interface to be in charge of their own data. This means during an appointment or any other time, the doctor would have to send a request if he needs to gain access to some of the patient’s data. The patient will, therefore, have to power to make a decision whether to give the information or not. Apart from that, it will greatly improve the patient’s sense of agency. One of the greatest advantages of blockchain is its interoperability feature. The current HIS use different types of standards and protocol in ensuring that data is accessed throughout the hospitals. Unfortunately, these standards and protocols can lead to some complexity when it comes to integrating new platforms and systems. The solution to all this is, therefore, top blockchain development companies that can solve all these issues and acts as a decentralized database. Blockchain can also help a lot in traceability. One of the main problems in the healthcare industry is the drug counterfeit system that the healthcare industry should fix for good. Thankfully, if the whole supply chain is taken back to blockchain all these issues of drug traceability can be solved. This is a good example of how blockchain is beneficial to the pharmaceutical industry. Besides, blockchain will provide an end to end solution to ensure that all platforms work together. This system will not only track the drugs but also improve the whole process. This is also major problem when it comes to the healthcare system. The current healthcare system not only needs a specialists team but also requires a system to ensure that all the operations are running smoothly. With a blockchain development firm, data will be distributed across networks to ensure that instances of failure are minimized. If one source of data goes down then data can be fetched from other nodes where there are other copies. This mechanism is quite amazing since it will assist the hospitals in coping up with any emergencies. Blockchain technology development firms will also provide universal access to all its users. Since it does not depend on any centralized authority to make the access possible, authorized persons can easily access the data whenever they need it. Similar to smart contracts the whole process can be automated using different mechanisms. In addition, blockchain will provide a structured way to keep the patient’s data. This will ensure that data can only be access by the right professionals. Since the patient will have full authority to his data he or she can rebuke access at any time. Considering the current situation, blockchain technology holds a lot of promise to the healthcare industry. Although blockchain technology is still in its infancy, it’s expected that there will be a lot of improvements in the near future. This means the future is quite bright for the healthcare industry. However, for this to happen, this solution must be widely implemented in both the private and the public healthcare system. If it’s only adopted by a few people then it will not work. Since this is the final hurdle, the industry still needs a few more years of constant trust and development for it to work.